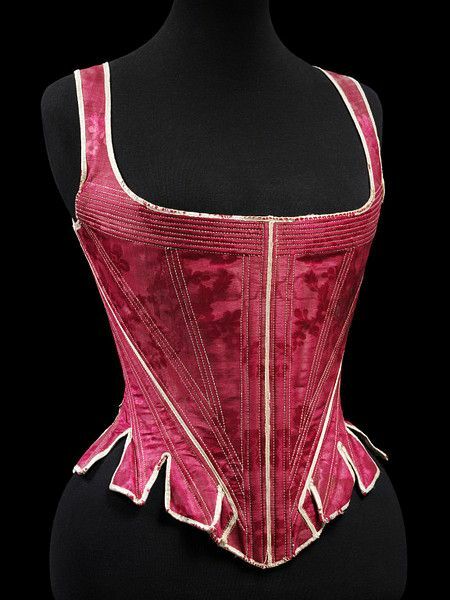 English Stays (1770-1790), made from red silk damask, Victoria and Albert Museum. My last pair of 18th century stays took about 13 years to finish, and by the time they were finished they didn’t fit me, so I have decided to make another pair. I finally decided on a half-boned style, and used this pair of red silk damask stays (from Victoria and Albert Museum) as a starting point. Stays of this era were designed to conform the body to an inverted cone shape, with a round bosom and a much smaller waist. They were also quite elongated, to draw the body upwards, and therefore came up high under the arms. The armholes were placed further back in the garment and, along with the shoulder straps, were designed to force the shoulders backwards to create the desirable “small back” posture. My dear Louisa, you will laugh when I tell you, that poor Winifred, who was reduced to be my gentlewoman’s gentlewoman, broke two laces in endeavouring to draw my new French stays close. You know I am naturally small at bottom but now you might literally span me. You never saw such a doll. Then, they [the stays] are so intolerably wide across the breast, that my arms are absolutely sore with them; and my sides so pinched! – But it is the ‘ton’; and pride feels no pain. 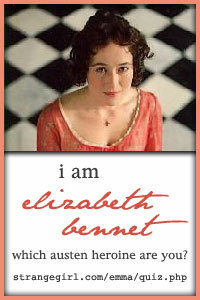 It is with these sentiments the ladies of the present age heal their wounds; to be admired, is a sufficient balsam. I really like this style of stays, with the round, broad oval neckline and the way the bones are wrapped diagonally around the body. It looks very flattering for the 18th century figure! 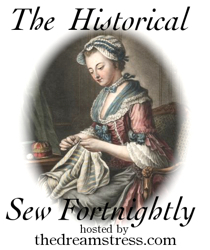 This project fits well with the Historical Sew-Fortnightly Challenge #12, hosted by Dreamstress. 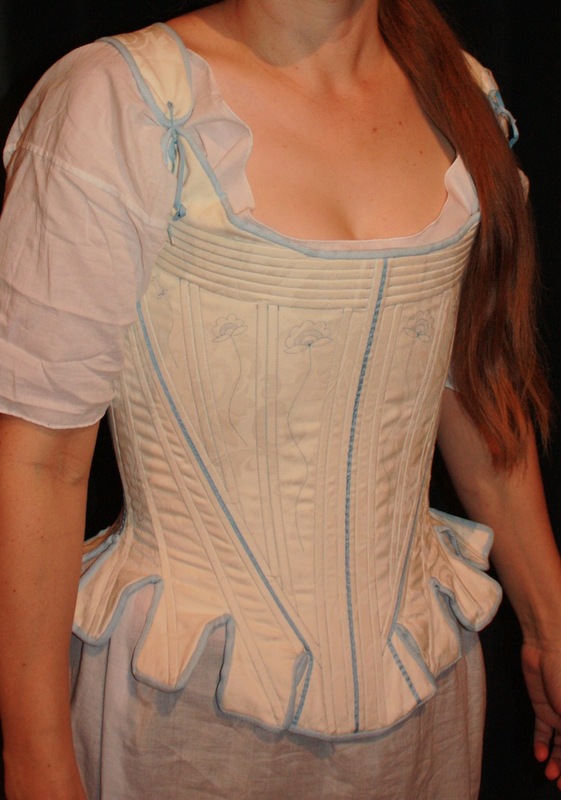 The pattern I have used is based on the 1780’s pattern from Corsets and Crinolines, by Norah Waugh. This one is very similar to the one pictured above – in fact it may be the same one, despite the minor styling differences apparent in the printed pattern. 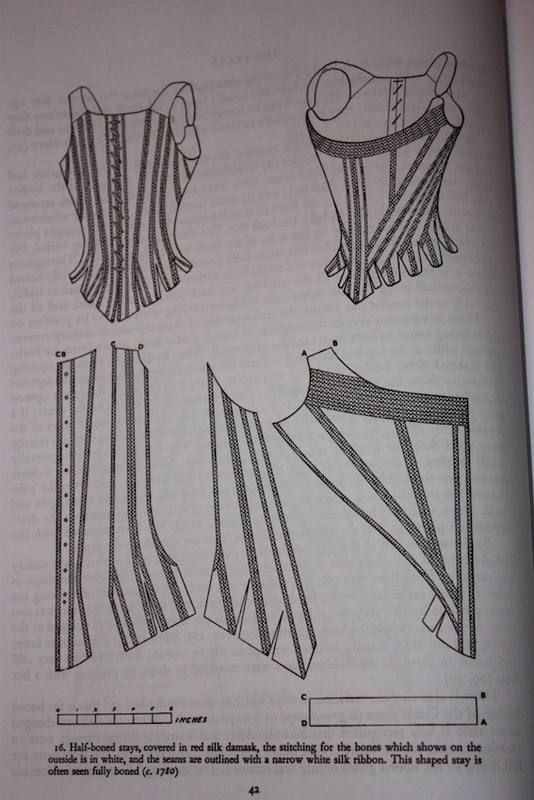 A pattern for 1780’s stays, from Corsets and Crinolines, by Norah Waugh. 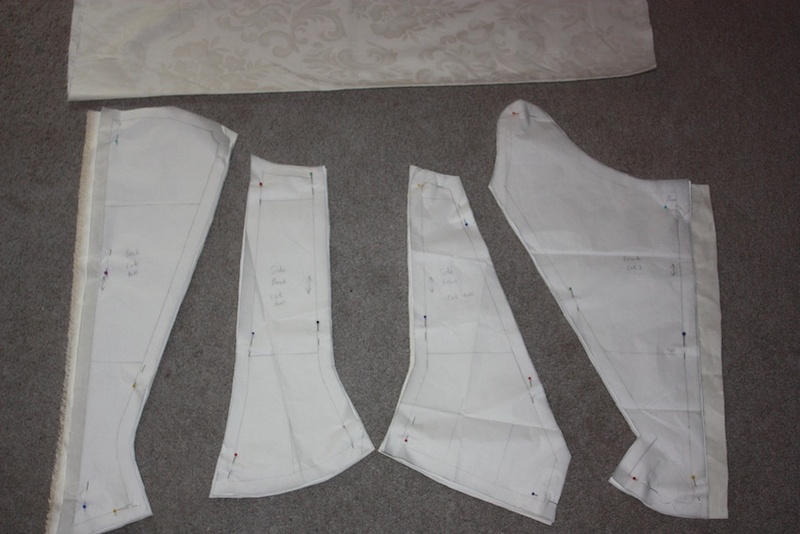 Beginning with my measurements and a piece of paper, I drafted my pattern up, using the Corsets and Crinolines pattern as a guide to panel shape and grainline. I used eight panels: 2 x centre back, 2 x side back, 2 x side, 2 x front. The panel pieces are all cut, excepting the shoulder straps which I cut and fitted at the very end. Four layers of material were used in this pair of stays. The outer layer was a cream/pale yellow cotton damask. The two interlining layers were a white cotton duck. 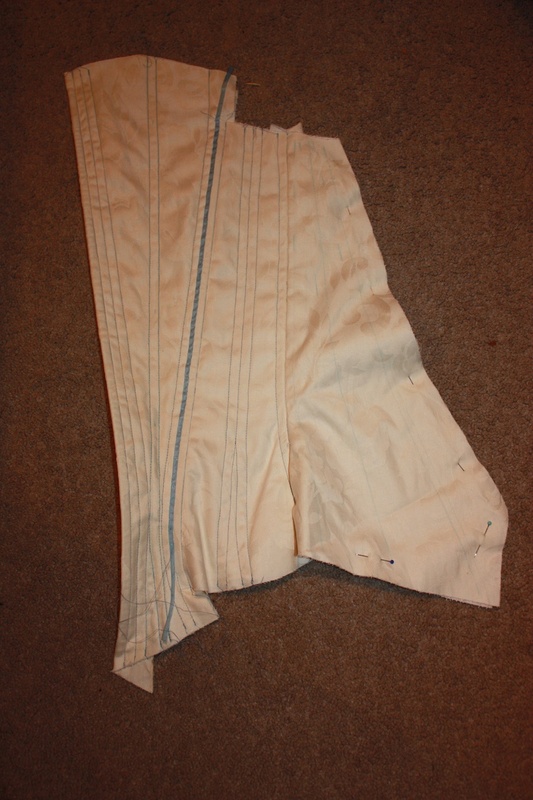 The inner lining was a white cotton lawn. I used 6mm plastic boning with a tiny bit of 12mm plastic boning in the centre front. The embroidery was done with plain cotton sewing thread. 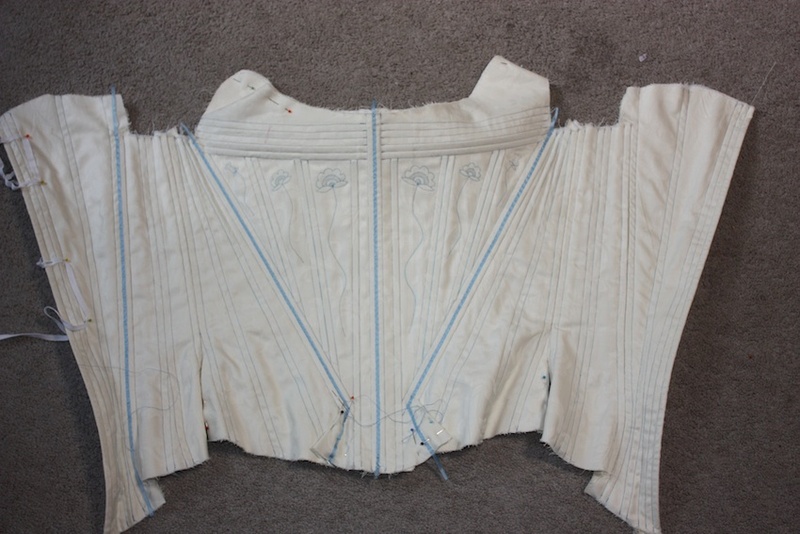 In order to construct these I referred mainly to How to Make an 18th Century Corset but I have also detailed my progress below. Step One: Draft the pattern up on paper, using your measurements. 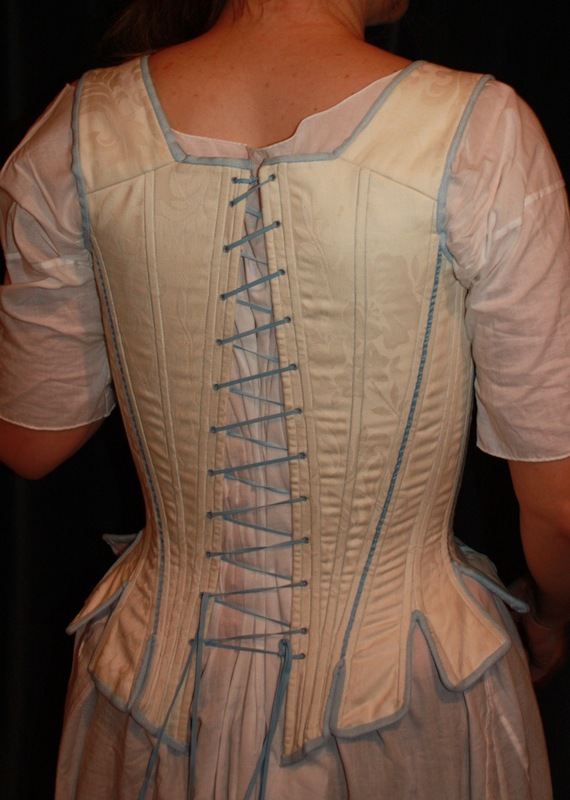 Do a toile to fit it to your body, marking any alterations on your pattern. Cut out the pattern pieces. Step Two: Sew the panels together. I pressed the seams to alternate sides (rather than pressing each seam open) in order to alleviate stress on the seams. The top layer is damask, then there are the two interlining layers of cotton duck. The lining was sewn in at Step Seven. I found it easier to piece together the back, side back and sides first and then do the fronts separately until I was ready to put in the boning. This is because the front panel has boning that goes in different directions, rather than just up and down. Step Three: Sew boning channels and then add boning. 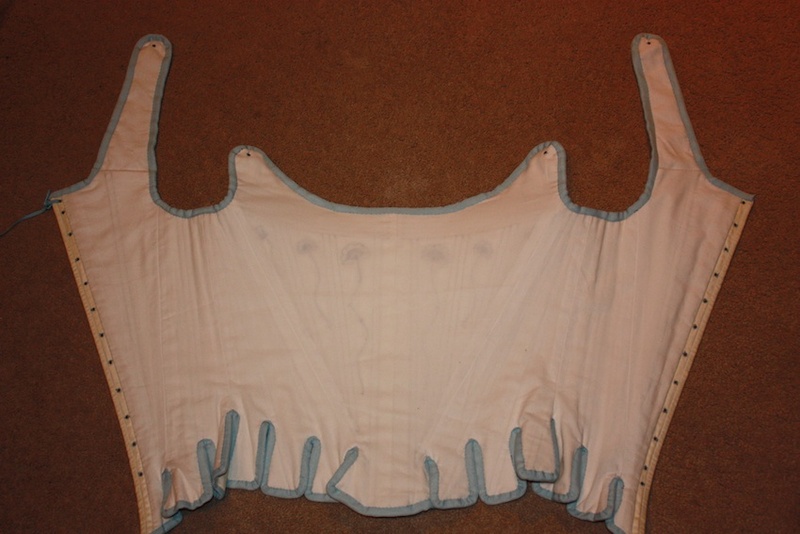 One side of the back, with the centre back, side back, and side panels sewn together. Some of the boning channels are sewn. I am beginning to applique the ribbon on the seams here as well. Step Four: Apply ribbon to the seams. I used nylon ribbon, as it was thin and of a similar thickness to silk ribbon. The boning should be inserted into the channels before you apply the ribbon, or else you may sew the channel shut by accident! I used a simple running stitch to applique the ribbon on, as this appears to be what was used on the extant pictured above. The centre front panel, with ribbon being applied. Step Five: Add embroidery or other embellishments. Whilst a great deal of embellishment was not frequently used for stays unless the front was to be seen as a stomacher, some smaller amounts of embroidery (usually straight or curved lines) was occasionally used. I generally embroider my stays because I enjoy doing it and I think it looks pretty! The central splays of boning are slightly different to the original, as the size of the panel is a little different. I have embroidered an 18th c. stylised set of buds and flowers between each. Note that the horizontal boning at the centre front is continuous and goes behind the vertical boning. Using two layers of interlining helps, as you have two separate layers to run the crossing bones. 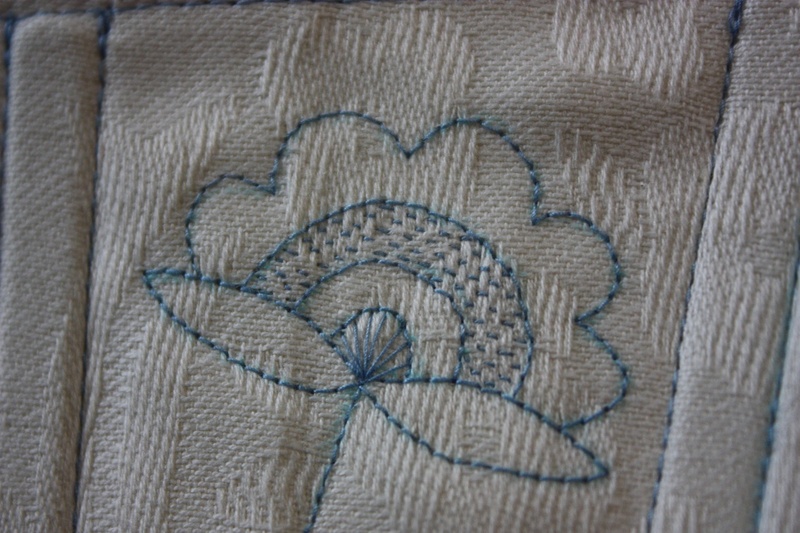 The detail of the central embroidered flower, using mainly backstitch and running stitch. Step Six: Hand sew eyelets and add lacing. Step Seven: Attach shoulder straps. I did this as one of the last things, as I wanted to be able to try it on first so that I could fit the shoulder straps properly. Step Eight: Cut the tabs after fitting it to your body. Cutting the tabs later in the process saves them from fraying everywhere or getting damaged in the construction process. 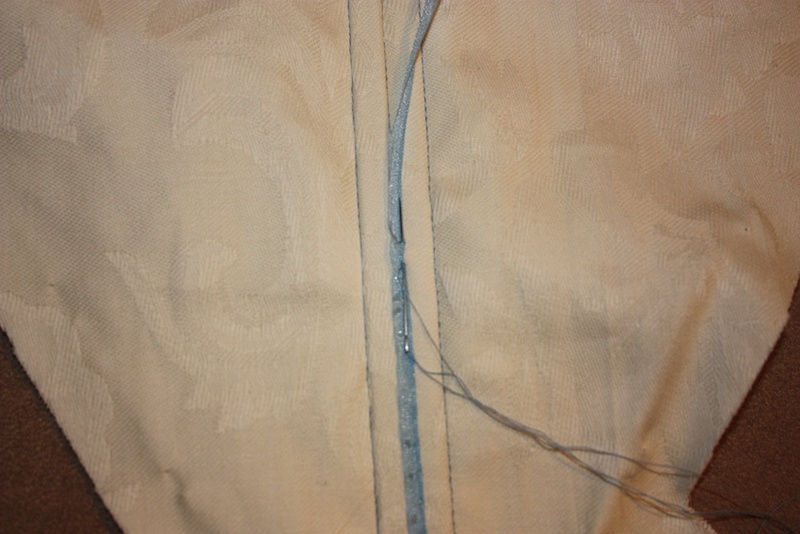 I used a buttonhole/blanket stitch over the raw edge of the stays, and then added the binding. I used twill tape for binding and sewed one edge down to the right side of the stays before folding it over and handsewing it down on the inside. You can see the blanket stitch visible on the raw edge. 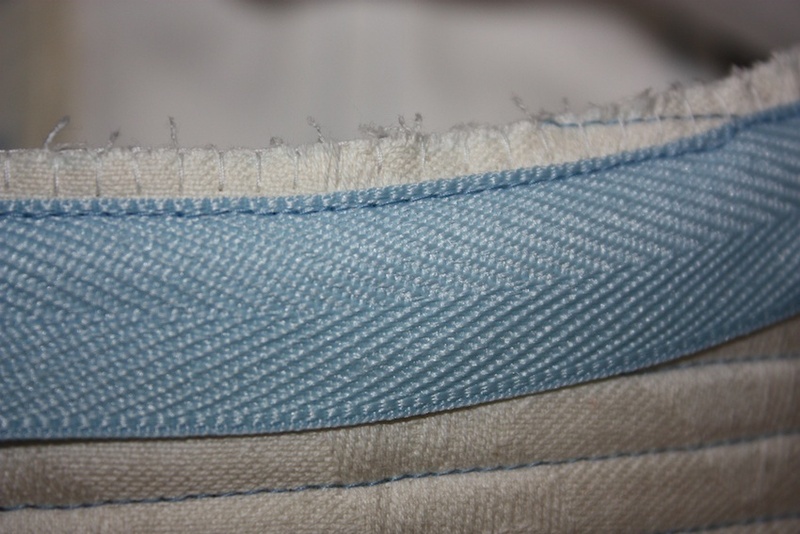 The extant stays pictured above have areas where the binding has worn away to reveal the raw edge sewn over with what looks like a blanket stitch. I was interested to try this technique as I wondered if it helped keep a narrower bound edge. 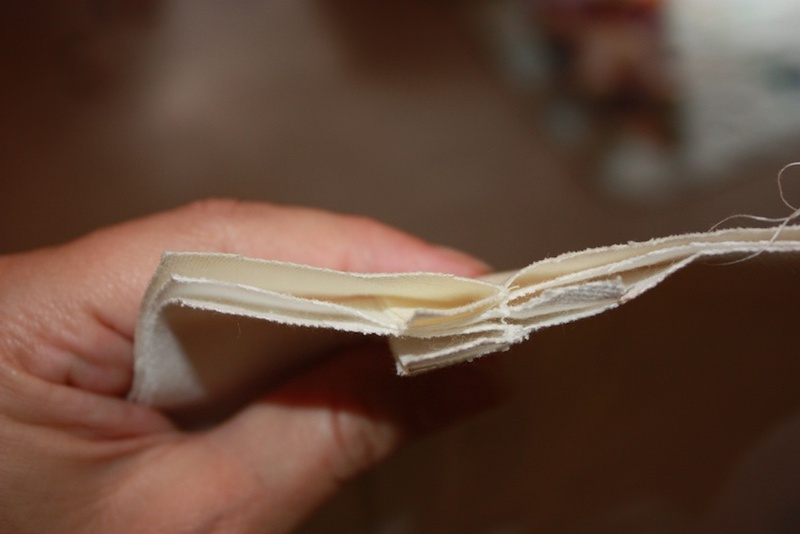 It certainly helped with reducing the fraying as the binding is completed! The other HSF items to cover are firstly historical accuracy, which was pretty good. Obviously the stay pattern was made to fit me, rather than an 18th century women that has been wearing stays her whole life, so the pattern is slightly different in shape to extant ones of the period. The fabric I chose was semi-accurate as cotton was in production then, but often linen was used for stay making. Secondly, the number of hours it took to complete are hard to calculate, as many hours were spent pattern drafting and making a toile. I began this project four months ago, but didn’t work on it solidly through that time. I am guessing 50 hours? Maybe more? Thirdly, it was first worn to a Three Musketeers Ball the day after it was completed! And lastly, the total cost was about $60 AUD. My next post will be on my 18th century chemise made to go underneath. 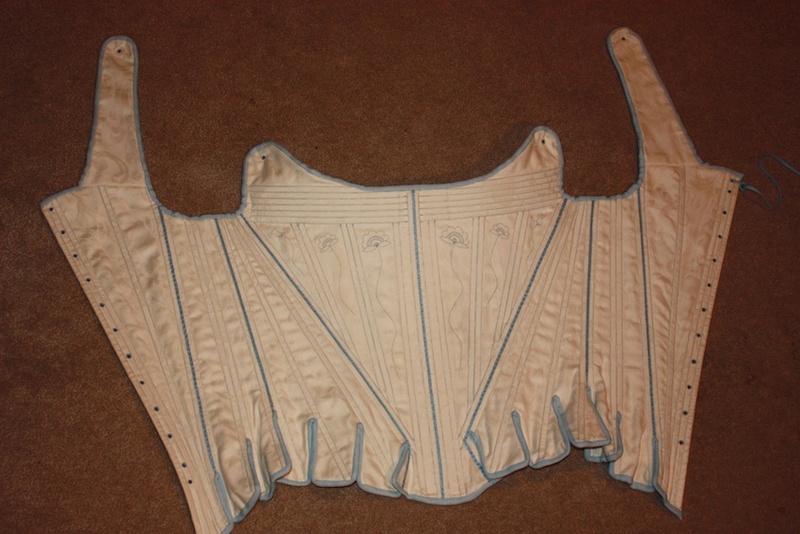 My Regency Journey: How to draft a corset pattern – a helpful beginning to drafting a pattern if you have never done it before.